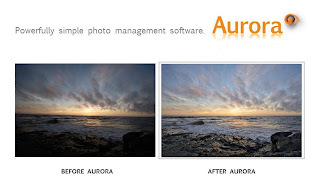 Aurora is a powerfully simple photo management software for consumers who want to reduce the complexity, and increase the results, of editing, organizing, sharing and storing digital images. Aurora is intuitive to use, enabling anyone to go from download to expert in a matter of minutes. o Visual photo editing: The strength of Aurora lies in its intuitive, powerful, visual editor which presents suggested improvements in a what-you-see-is-what-you-get fashion. The unique relight tool essentially “turns on” the light inside the image, creating better, more realistic photos. Users can also straighten, adjust color strength and warmth, crop, zoom and adjust red-eye in a simple, intuitive and visual way. o Organizing and viewing of photos: Aurora allows consumers to easily import photos from their camera or computer, re-arrange and re-name them, then tag and rate favorites for easy viewing and retrieval. o Sharing and publishing: Aurora enables consumers to email, print, and connect directly to their photo sharing, social networking and accounts from within Aurora making it easy to share select photos online on sites like Flickr and Facebook. o Online back-up: Photos are one of those truly irreplaceable items. Aurora’s optional online back-up service is powered by Amazon.com and stores photos to keep them out of harm’s way. Online back-up plans are available for $4.95 per month. Users can simply hit “online back up” from within Aurora to sync directly with their Amazon storage account. You can find more information about Aurora at www.lightcrafts.com/aurora. I, like you, I am sure, have TONS of digital photos on my PC. Photos taken from digital cameras uploaded to my pc to scanned photos from years ago. Aurora was able to correct many issues of the photos, from low light, to discoloring. I was able to crop and edit with ease. I love this new photo editing program and *may* not need PhotoShop after all! 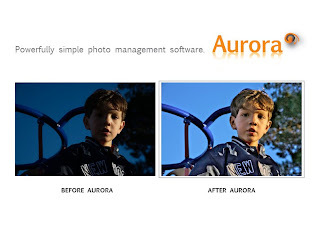 FIVE lucky readers will win a copy of Aurora to edit their own photos! Please fill out the form below to enter the giveaway! Please make sure to stop by Moody Mama Says and Everyday Baby Steps and enter one of their giveaways for an extra entry! Leave a comment here after entering with which giveaway you entered!